Latin American Dictatorships in the Era of Fascism focuses on the reverse-wave of dictatorships that emerged in Latin America during the 1930s and the transnational dissemination of authoritarian institutions in the Era of Fascism. 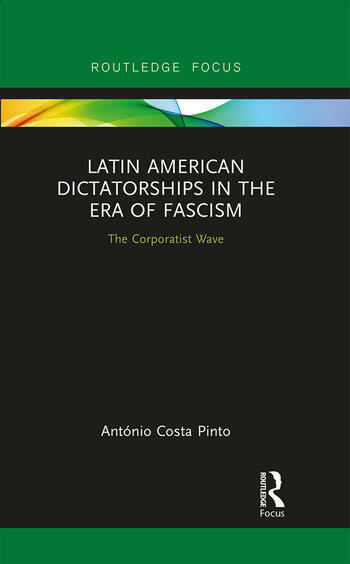 António Costa Pinto revisits the study of authoritarian alternatives to liberal democracy in 1930s Latin America from the perspective of the diffusion of corporatism in the world of inter-war dictatorships. The book explores what drove the horizontal spread of corporatism in Latin America, the processes and direction of transnational diffusion and how social and political corporatism became a central set of new institutions utilised by dictatorships during this era. These issues are studied through a transnational and comparative research design to reveal the extent of Latin America’s participation during the corporatist wave which by 1942 had significantly reduced the number of democratic regimes in the world. This book is essential reading for students studying Latin American history, 1930s dictatorships and authoritarianism, and the spread of corporatism. António Costa Pinto is Research Professor at the Institute of Social Sciences, University of Lisbon. He has been a visiting professor at Stanford University, Georgetown University and a senior visiting fellow at Princeton University, the University of California, Berkeley and New York University. He is the author of The Nature of Fascism Revisited (2012) and co-edited Rethinking Fascism and Dictatorship in Europe (2014) and Corporatism and Fascism (2017).